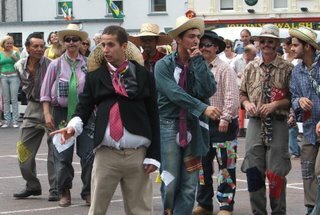 An innocent traveller passing through the small town of Gort in the west of Ireland yesterday would have been forgiven if he suddenly felt he was suffering the after-effects of swallowing some hallucinogenic concoction as they experienced a feeling of being magically transported to tropical South America. 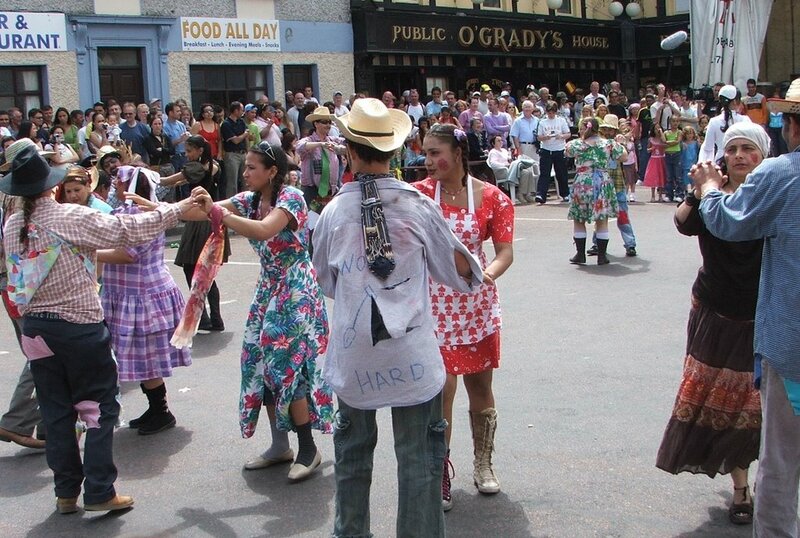 For the flags, colours, ethnicity, language, music and dances of an Amazonian river port transformed a normally placid rain-sodden wind-swept Galway town into the sunny Samba Capital of Ireland. 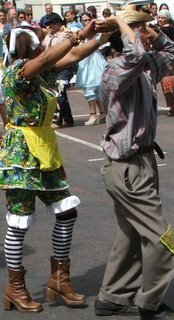 A Brazilian ‘Brigadoon’ ensued as waves and waves of dancers in outrageous rainbow attire appeared on the streets to enact the traditional festival of ‘Quadrilha’. 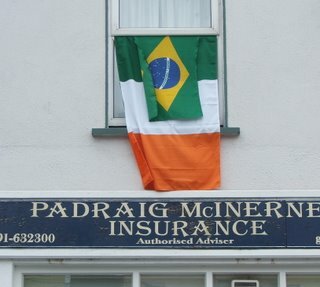 Gort, with probably the largest concentration of Brazilians in Ireland, became the gathering point for their compatriots working in Roscommon, Cork, Dublin and elsewhere. Even the Brazilian ambassador to Ireland turned up to give his seal of approval to the antics of his fellow countrymen and women. 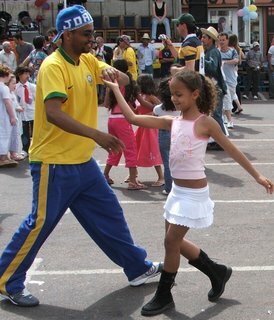 The event was a credit to the organising abilities of local volunteers such as Rosiliane de Silva who put on a street carnival ‘par excellence’ that put an infectious smile on the faces and a lilt in the steps of every visitor. 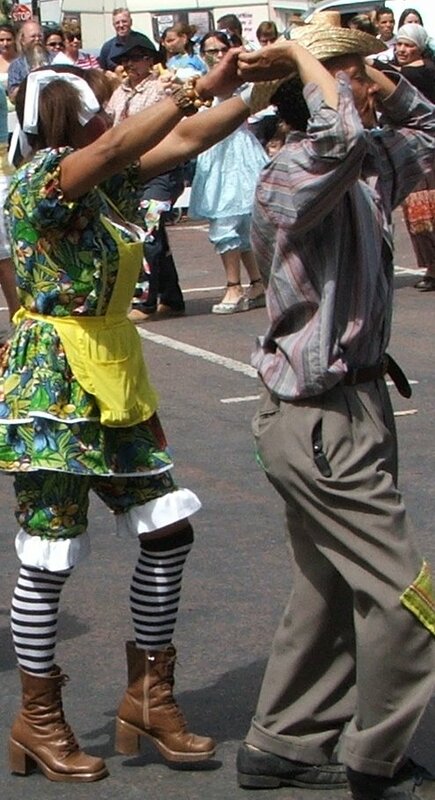 We enjoyed the sights, sounds and smells of Latino cuisine, samba bands, old-style farming community group dances to more modern pulsating urban dances such as the ‘Axe’. Many of the native Irish present were so overwhelmed by the delights on display that they quickly donned yellow and green jerseys and shouted greetings in pidgen portuguese to every passerby! 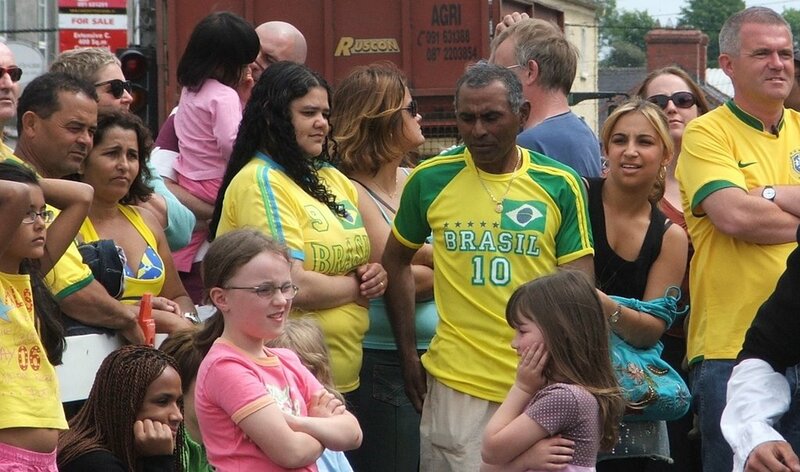 The two Brazilian shops on the main street did a roaring trade. The unbelievably hot weather combined with Brazil's involvement in the World Cup made it seem as if we were all ‘Brazilian’ for the day! 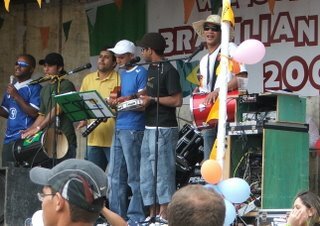 'Quadrilha' - A Lesson on How To Enjoy a Festival without Getting Blind Drunk! 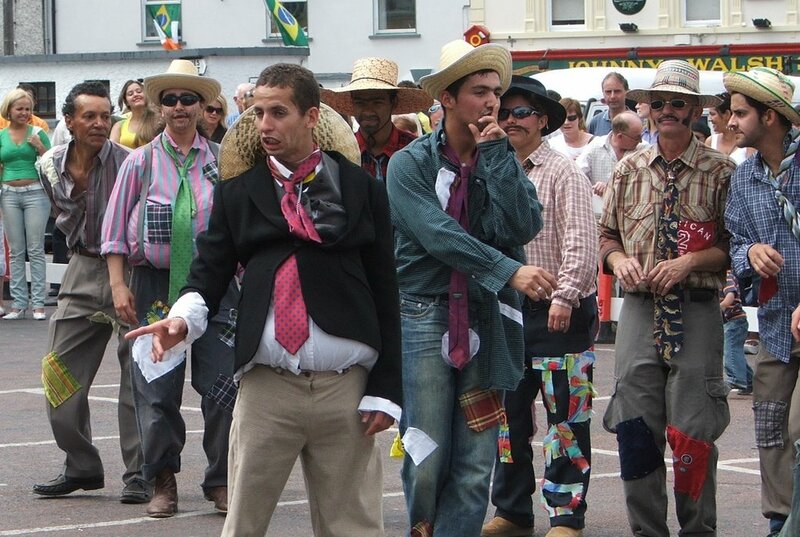 But the most striking element of the festival was the almost total absence of alcohol combined with the wide variation in age of both participants and visitors alike. 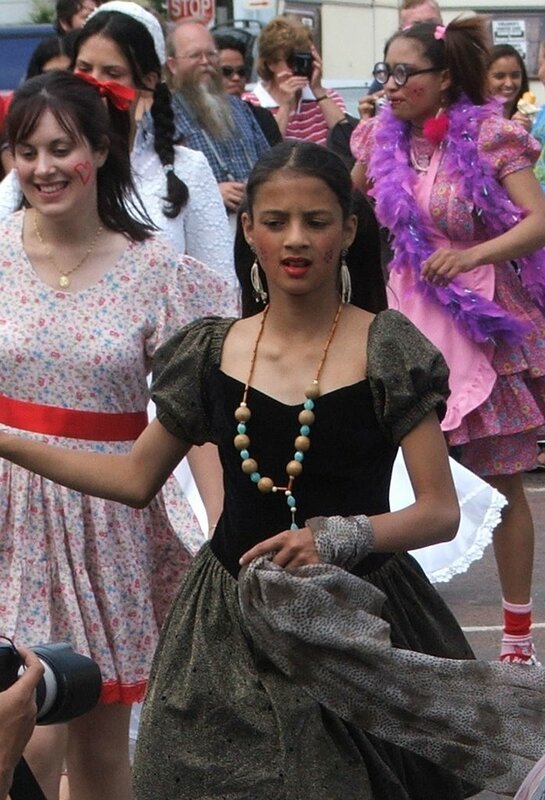 I saw costumed mothers and daughters dancing together joined later by infant grand daughters and cousins. Of course there were skimpily clad girls gyrating to the music joined by their over-friendly boyfriends and there was drinking a plently within the pubs surrounding the square. But this is in no way contradicted or took away from the beautiful family atmosphere that pre-dominated. I looked hard to find evidence of annoying drunks, street brawling, empty beer cans, broken bottles, urinating and vomitting. I am happy to report that I failed totally in my endeavours. What summed it up was that over the course of four hours I saw only one police man on duty. 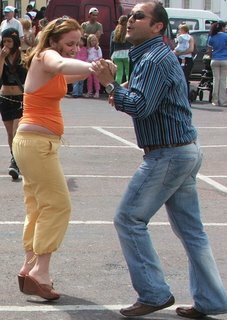 When he wasn’t on traffic duty, he was standing around like the rest of us admiring the Latino dancing. If for nothing else. 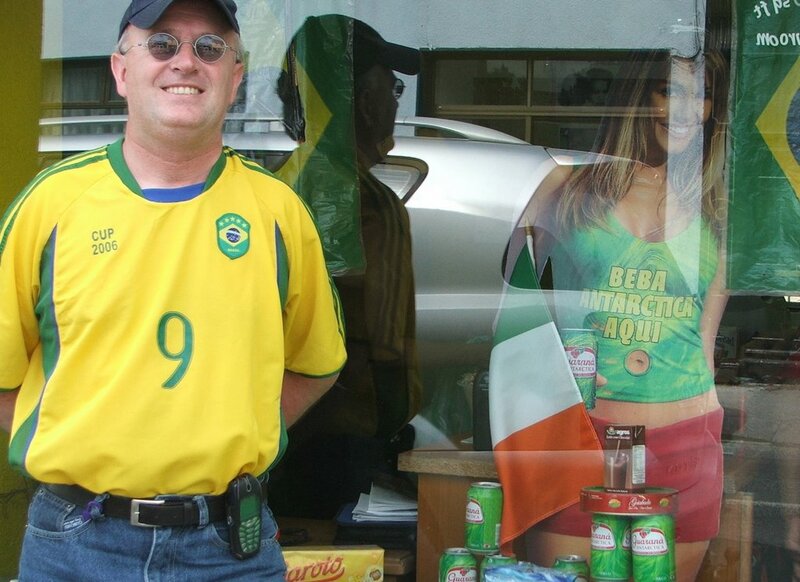 the Irish can learn so much from the Brazilians on how to party! 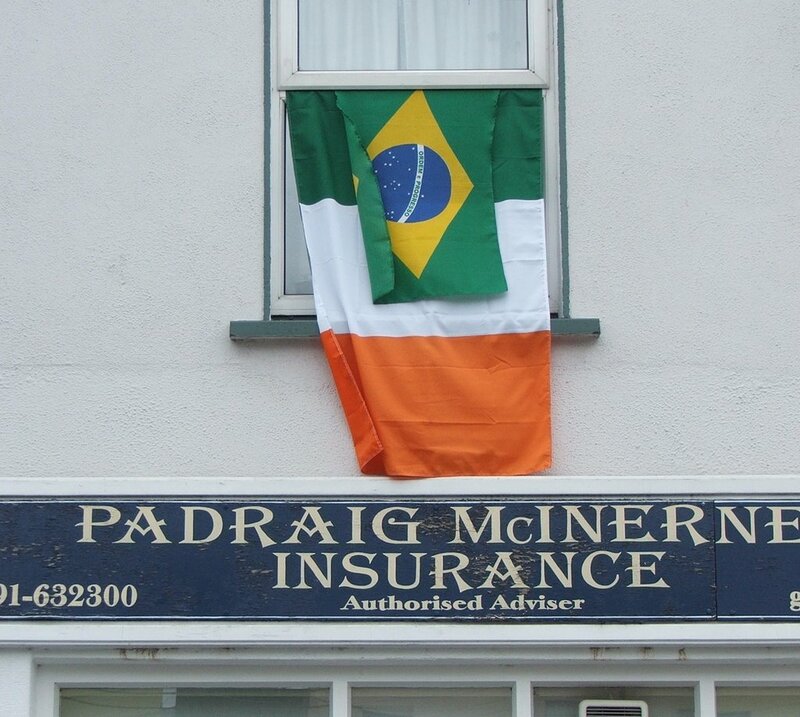 It is also worth noting that the Brazilians gave due respect to the country that they now find themselves living in by hosting almost as many 'Irish' flags as 'Brazilian. Not all Brazilians are mad Party-goers! 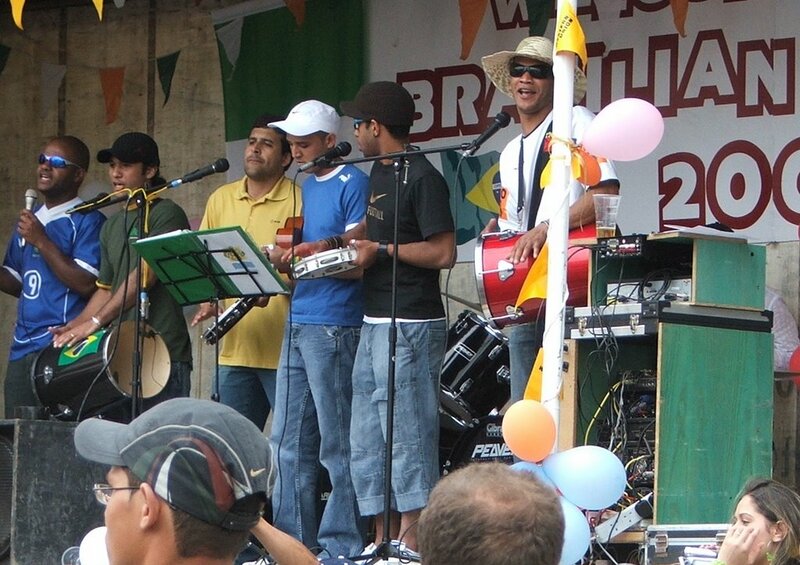 Interestingly not all of Gort’s Brazilians participated in the festivities. I saw many of them travelling back to the town late that evening when the street party was ending; some with lunch boxes under their arms. They probably spend all day working in in hotels, shops, farms and construction sites. Furthermore. there is also a sizable local community of evangelical Christians from Brazil who do not agree with the public carnival displays of their Catholic countrymen. Likewise, read my previous article on Gort’s Brazilians. This is one of Brazilian favourite festivals. It takes place every June and has nothing to do with samba, but, just like Carnival it has pagan an christian origins. do you know if this festival is on this year? Thanks for that Heather. I am sure that the Quadrilha is happening once again in June. But you should contacat the Chamber of Commerce in Gort for confirmation from their website that you have me the address to. I actually just emailed them after I got your message expressing surprise that they did not request my permission to use my article on the Quadrilha. I said that I would have had no problem with the Chamber using it (after asking!) but that I would like them to mention my authorship. We are from NZ and passed thro Gort in June and was amazed at the number of East Europeans living in the west coast of Ireland. What is the attraction for these immigrants to this beautiful part of the country. It is truely amazing how many Eastern Europeans have moved to Ireland in the last few years. It is as a result of the accession of Poland, Slovakia, Latvia, Lithuania & Estonia into the European Union at the begining of the decade. I am looking for a samba band/dancers to play at an even in Galway in Jan- can you recommend any?